I looked over my shoulder just beyond the escape point to see if the Crow was following but much to my delight its beady eye was watching north – little did I know that my winged nemesis used more than vision to stalk its prey. Escape from Meriden, the prison break was on. But let me roll back a little to explain the race and why I was running it. EFM is the brainchild of those sadistic types at Beyond Marathon – turn up at the centre point of England and at 23.59 you run as far from Meriden as you possibly can in 24hrs. No aid stations, no support (unless you bring it yourself) and no defined route (unless you’ve planned one). 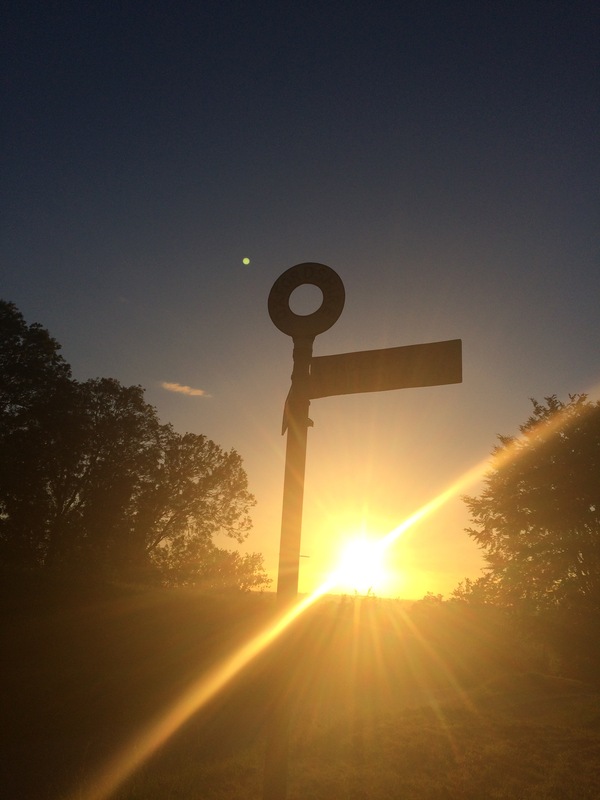 Then comes the both the carrot and the stick – your finishing point (or final resting place) will be ‘as the crow flies’ from Meriden and there are three distance level up points you could be rewarded for 30, 60, 90 miles. The crow and the race would be a very cruel mistress and that’s why I wanted to be involved. Unsupported I wanted to experience the challenge of facing myself, my own route and whether I had it in me to get over the 60 miles (as the crow flies). I’ve already mentioned in my race preview that given I would be off to South Wales in a few weeks that I would drop my distance at Meriden but not by much – I dropped down from about 92 to 75 miles but I’d also run less time (somewhere around 18-20hrs) and instead of heading to London I’d amble along to a small village in Oxfordshire/Wiltshire. I had a clear and well defined plan. It sounds like my race preparation was going well doesn’t it? The trouble is my prep was going anything but well. Lower back/kidney pain has been a constant companion since about March, left footed heel pain has been nothing but a nuisance and a groin tear that makes any movement a possible lighting pain inducing experience / the annoying thing is that none of these were caused by running but they made my ‘Escape’ seem downright impossible. Well I ambled up to Birmingham International (£8 single, advance), jumped into a taxi (£12) and arrived into Meriden to see small pockets of runners ambling around. I joined them at the Methodist Church Hall were I was greeted by familiar faces from my SVN eventing – nothing better than a couple of friendly faces when you’re feeling a bit nervous. I grabbed my number, tracker, coffee, biscuits, t-shirt and a dark corner to get changed. The hall was now packed with a wonderful array of runners, hikers and their supporters and the atmosphere was exactly as I like it, friendly, relaxed but filled with a buzzing anticipation. Being completely alone in terms of my race approach made me feel slightly more nervous than usual but when the call came out to head up to the start line I was quite ready. I hurled on my waterproof jacket as the rain had started to come down and then plodded up to Meriden marker. I don’t know what I expected from the start line but as everyone set off in every possible direction I stopped to look around and take it all in. To describe it you’d say it was less of a prison break and more rats jumping ship… drowned rats too but we were off. With GPS on I was determined I would follow the route as closely as possible – ensuring I didn’t get snared into a mis-step by following another runner or taking what might be considered a short cut – Escape from Meriden was not about instinct it was going to be about following rules – perhaps this was my mistake. I drifted through the first few miles, merrily keeping myself to myself and even with the rain becoming heavier I decided to dispense with the services of my waterproof jacket, I felt it better to be damp than overheating. 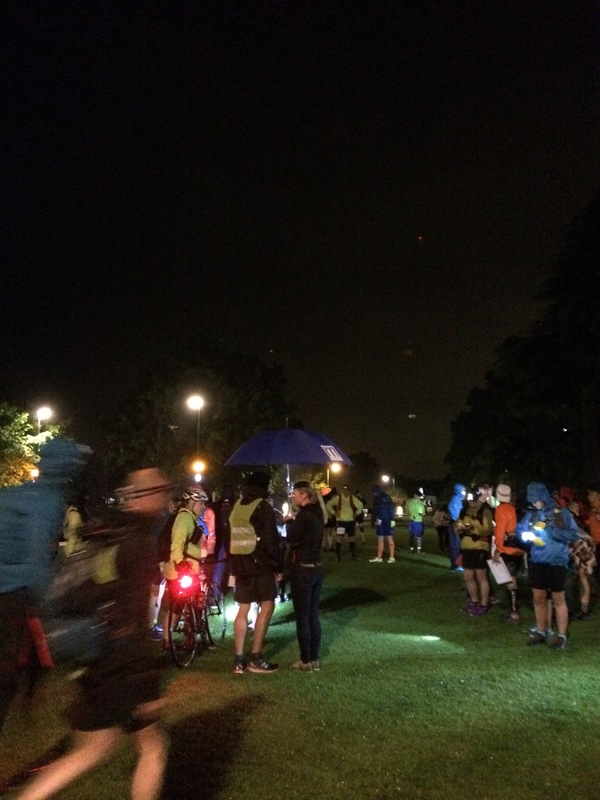 For a while I watched as the miles started to be clocked up, I even logged into the drone website so I could see the progress of my fellow runners but the sheen soon wore off as the reality of the rain kicked in. However, despite the weather I knew that I needed to make maximum progress while it was dark as the heat of the day was likely to wipe me out. I passed through small villages and hamlets throughout the night and delighted in the peace and tranquility of my route. This was punctuated only by the roar of ‘boy and girl’ racers using the dead of night to test how fast their Alfa Romeos and souped up Corsas would go. Light was much earlier than I expected arriving for me around 4am and the arrival of light always brings with it renewed hope – strangely though rather than hope it brought hunger. I had munched my way through much of my very limited supplies and therefore when arriving into the towns on my route to the discovery that everywhere was closed proved mentally challenging. I was hungry, very hungry, my choices were limited to stopping for more than an hour and wait for the garage to open or 2hrs 15 for the Co-operative to open or I could continue and accept the hunger. Thankfully as a distraction from my hunger there was an unspecified pain across the top of my foot, which I unwisely ignored. Had I been brave enough to stop and look I’d have seen a massively swollen right foot with a tenderness that really shouldn’t have been run on. Ho-hum! On the positive side of distraction though we had Riccardo from Italy who epitomised the ultra running spirit – carefree, spirited and determined. His company for several miles made the early morning meandering much more palatable. The issue of food had not been resolved though and without any support or checkpoints this was going to start becoming an issue as my water supplies were lowering too. I rolled into the next town to discover a Co-op that was open about 7.30am. I could smell myself from sweat, rain and mud and wanted to restrict my human interaction – I find trying to explain ultra running quite a chore when I’m mid event. I picked up some chocolate milk and some Lucozade and asked the lovely Co-op ladies if they knew of a local cafe or bakery that might be open – they just laughed. Hmmm, if this had been France I’d probably have had the choice of half a dozen bakeries and eaten my own body weight in croissants but as it is the UK I had to have chocolate milk and Lucozade. I hoped that later stops might furnish me with something a little more delicious… well you’ve got to have hope right? Feeling refreshed, my bag rearranged, night time kit locked away and starting to finally dry off I pressed on a little quicker heading out of Shipston with all the effort I could muster. The day was now in full flow but the heat hadn’t yet set in so it was worth it to try and get as far beyond the 30 mile point as possible. Despite passing through 50km I still hadn’t crossed the 30 mile ‘as the crow flies’ line but it surely couldn’t be far? Daylight brought me into The Cotswold and an area of the country that I’ve not really been running round very much. What I discovered was large swathes of beautiful British countryside and farmland and I finally understood why people move out to places like this. It had been some time that my foot had been an issue during Escape from Meriden but I remembered to take some pain killers but now my back/kidneys ached and my groin strain was shooting the lightning bolts of pain up and down my leg that have been synonomous with my running in recent weeks. Having gotten through the 30 mile point I did seriously consider stopping – but I had come here with an objective and that objective was the 60 mile ‘as the crow flies’ marker and that was still at least 30 miles away. More and more small villages were run through and the pain I was in grew worse and worse but I felt having committed to not stopping that I had to make the effort count. At 12.47pm I ambled into a town with another Co-op, this could have Wychwood, it could have been anywhere but I sat tired and sore on a park bench with some houmous, baguette and more chocolate milk (I also replenished the Haribo), a wise choice having learned that The Cotswold effectively has no retail presence! Fed and watered I set off again but this time in search of a toilet – as you can imagine if shops are hard to come by then public toilets are even harder and I didn’t feel it appropriate to use the local publicans facilities. However, I was lucky enough to find a delightful and discreet field where I could release the contents of my bowels all over the countryside. I have to say I’ve become something of expert at this and my process is now so well rehearsed that my hands are washed long before there’s any whiff of indiscretion by an ultrarunner. The next 40km were probably the worst of the race, very limited resources for water, hot and very busy ‘A’ roads. I was as careful as it was possible to be and for the most part drivers were very considerate of a runner using the side of the road. However, I remained vigilant and was mindful to move out of the way of larger vehicles, stepping into the grass verges or nettles when required. The trouble is that there were many drivers with their soft top sports cars out speeding through the countryside, flexing their machismo and then there was the red Nissan Almeria driver who refused to move from driving too closely to me, despite there being no traffic on the other side of the road, clipping me with his wing mirror and then hurling abusive language at me for using a road we were both perfectly entitled to be on. Given I was tired this played on my mind – he might have killed me and it forced me to rethink a little bit for rest of the event. However, the clock was ticking and I had promised the GingaNinja that I would arrive at my finish point near her parents house as close to bedtime for UltraBaby as possible. In order to do this I had to negotiate the slightly terrifying remaining busy Saturday A roads. No further incident was had in this section and in my head I was making calculations for a course correction. My route could be altered to go straight past her parents house and then onwards, albeit uphill about 4 miles and through the 60 mile barrier. The GingaNinja and UltraBaby being so close chose to come and cheer me on, which was a welcome distraction, although she had no kit I could use or food I could eat she could take my race vest which was no longer of any real use. I removed the tracker, my phone, battery pack and a water bottle and explained my plan to the GingaNinja hoping that I’d be able to finish the last 15km in the next 90(ish) minutes. My arrival at Faringdon was short lived and although there was finally a wide and varied selection of places to eat and drink I was no longer in the mood, nor did I feel I had the time and simply pressed on. The climb out of Faringdon isn’t much but when your feet are ruined and your nerves on edge then it feels very steep but despite this I made it to the main road and I nearly had a heart attack – it was the main road between Swindon and Oxford – Holy Shitburgers. The road was incredibly busy on both sides and the traffic gave you no quarter – the grass verge was massively overgrown and so I had little choice, having picked this route but to tough it out. In the gaps between the cars I would sprint as far as I could before leaping back onto the relative safety of the overgrown grass and nettles. Each time I did this my nerves jumped back to the knife edge from where the car had clipped me earlier, but despite tiredness creeping in and having now been awake for more than 45hrs, and running for the last 18 of them, I felt very focused and managed to weave my way down this horrible, horrible road. Eventually I found a diversion through a place called Longcot where traffic wasn’t an issue and slowed down, slowed my heartbeat and calmed myself. I was angry at myself for changing my route – this was stupid – and all to save no more than a mile. From here it was a quiet climb up to Ashbury, a small village, I assume in Wiltshire. I watched for a while as the sun bled from the sky. I watched as my little dot on the drone tracker finally passed the 60 mile marker, but I had run around 73 miles to achieve this. I felt broken but also nervous – had I done enough? I still had around three hours I could have used to progress further but I wasn’t going to get 90 miles as the crow flies and so there seemed little point and UltraBaby told me it was bedtime. With my body having taken a beating during this event I felt it deserved a few hours off. I escaped Meriden and I reached all my targets and yet I feel like I failed Meriden. I guess I’ll just have to return to prison and see if I can get out again. My normal criteria for judging an event doesn’t really apply here simply because the conditions are really quite unique. However, I’ll apply some logic and try and give a fair representation of EFM. Organisation: First class, there was good pre-event communication, an active social media community, a fair exchange of places policy, a well run, smooth and comfortable registration process. What more could you ask for? The race drones were a nice touch to make the event ‘cheat proof’ and it didn’t need to be any fancier than it was. Brilliant. 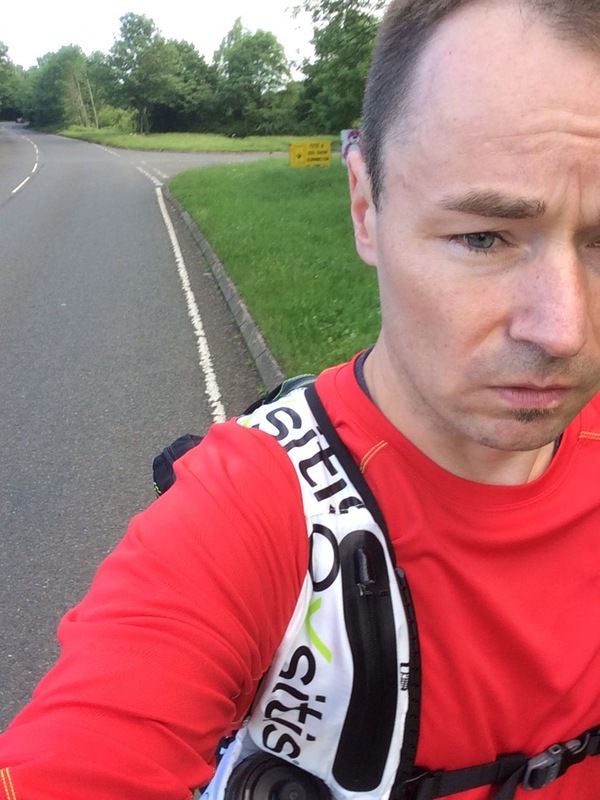 Route: I hold my hands up to making a huge mistake – I thought I could run the roads and the tarmac but it’s been years since I did more than a few miles like this. I’m conditioned for trail, built for trail and love trail. When I go back I will show the same level of detail to the route as I did this time but instead focus wholly on finding a decent trail route out of Meriden. My route, for a ‘as the crow flies’ was a good one and it had lots of lovely views but it hurt my feet and caused my existing injuries nothing but misery. Who is it for? That’s easy, this is a tough as buggery event but it is achievable by anyone, a decent walker could get a long way in an event like this and a good runner – well the sky is the limit. I like events that are inclusive like this – I’d recommend it to everyone. Conclusions: I earned my gold medal, I ran a decent distance, I got to the point I was aiming for yet I feel a little deflated. It didn’t go as well as I wanted and that was down to being injured before the event and then possibly breaking my foot early on during the event. I also selected a route that wasn’t right for my ability and I’d urge you that if you’re running this PLAN, PLAN, PLAN your route! However, this being said the event was amazing and I would return in a heartbeat and if anyone can’t use their winter place I would purchase it happily. This is one of those unique challenges that deserves its well regarded reputation and I’ll be back for more Beyond Marathon events (probably next year now) because they really do know how to put on an event.